The encoders are rather expensive (one encoder costs US$14.95). They need a hardware change to run at 3.3V. It is difficult to mechanically mount them on the chassis. 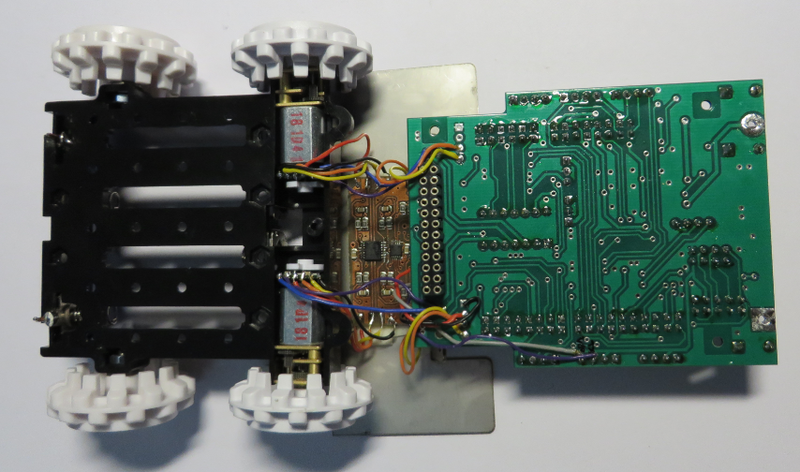 Because they are between the chassis and the robot PCB, this increases the height of the robot. The sensors tend to get polluted with dust from the ground/wheels, and then they do not run properly. So I was very excited when Pololu announced new motors with extended shafts (75:1 Micro Metal Gearmotor HP with Extended Motor Shaft), plus matching optical encoders (Optical Encoder Pair Kit for Micro Metal Gearmotors, 3.3V). Higher resolution: now I get 12 or 20 ticks per motor revolution (before the gear!) instead of 48 per wheel rotation (after the gear). 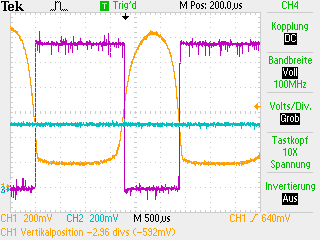 At full speed of the motor, I will get a signal change about every 200 µs. 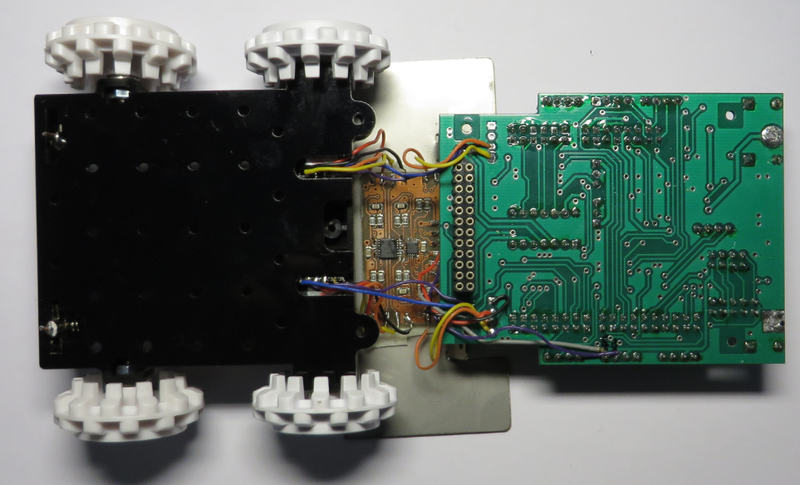 The encoders do not conflict with the robot PCB. There are 5V and 3.3V encoders available. They are less expensive: US$8.95 per pair. Of course there are disadvantages too, more about this later on. The speed of the signal is now very high, so I need enough processing power/time in the microcontroller. The encoder is very sensitive to ambient or sun light. This will not be a big problem for me as it will be inside the robot. 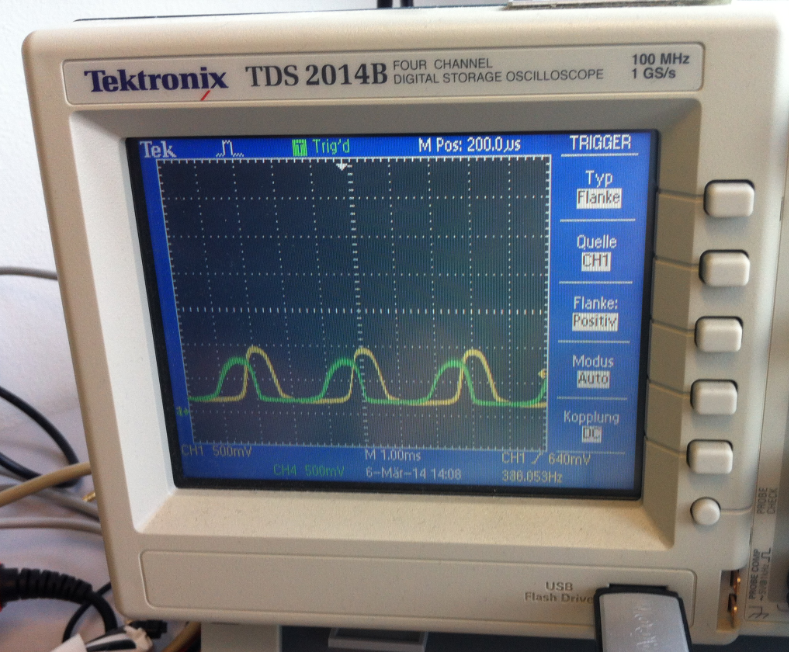 Putting the encoder wheel at the right distance is important, otherwise the signal is not good. But most important: the signal is not a digital one, it is a sinus one. ❗ While it would be technically possible to use the signal with a digital input pin, that only would work for small speed and if the signal is well-formed. 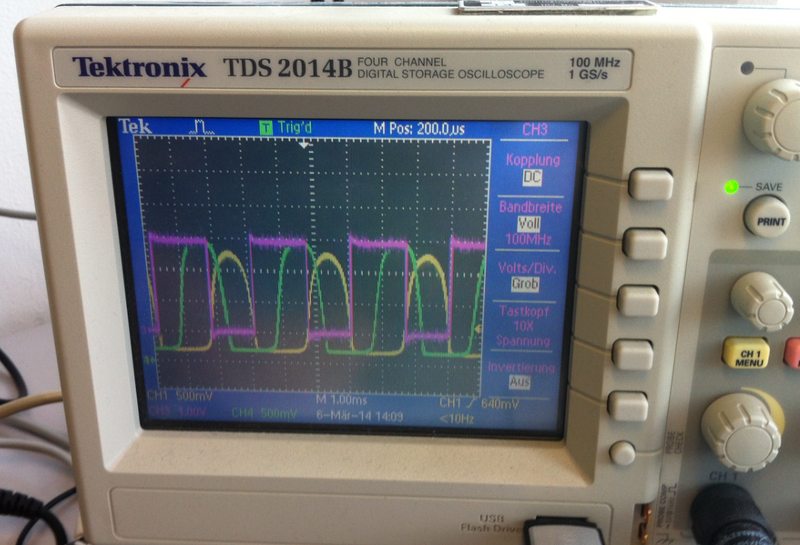 The amplitude of the signal will vary making the need to post-process the signal. They cost footprint and money too. 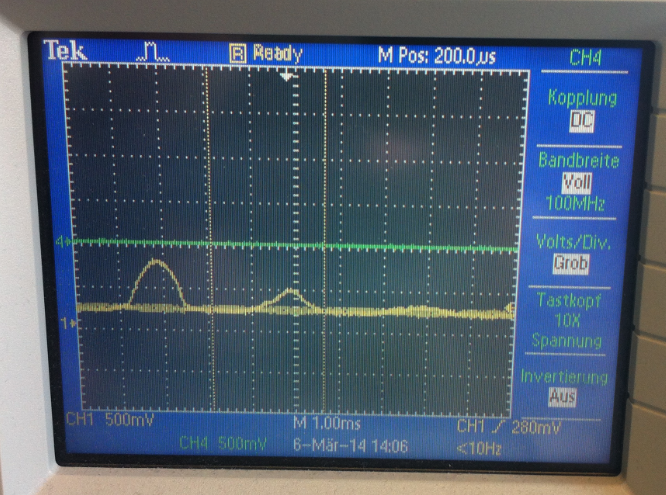 Measure the quadrature signal pulse width coming out of the system. 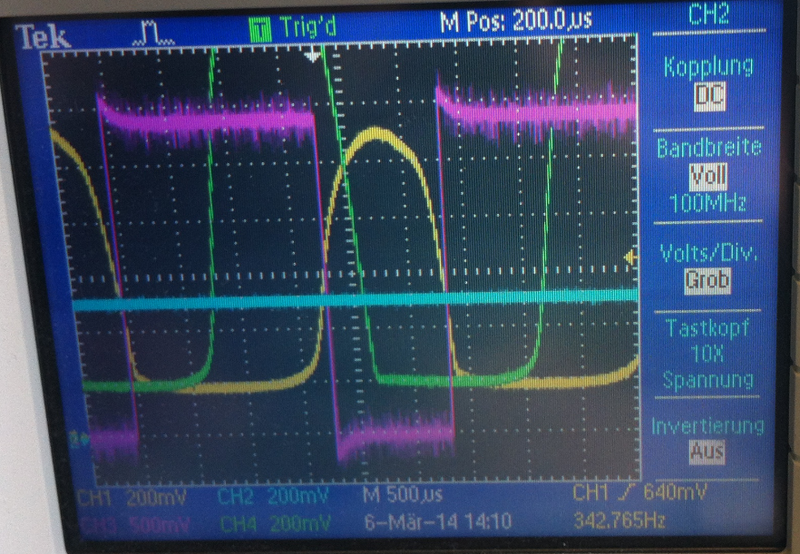 Adjust the signal with increasing/decreasing the analog voltage produced by the D/A converter. 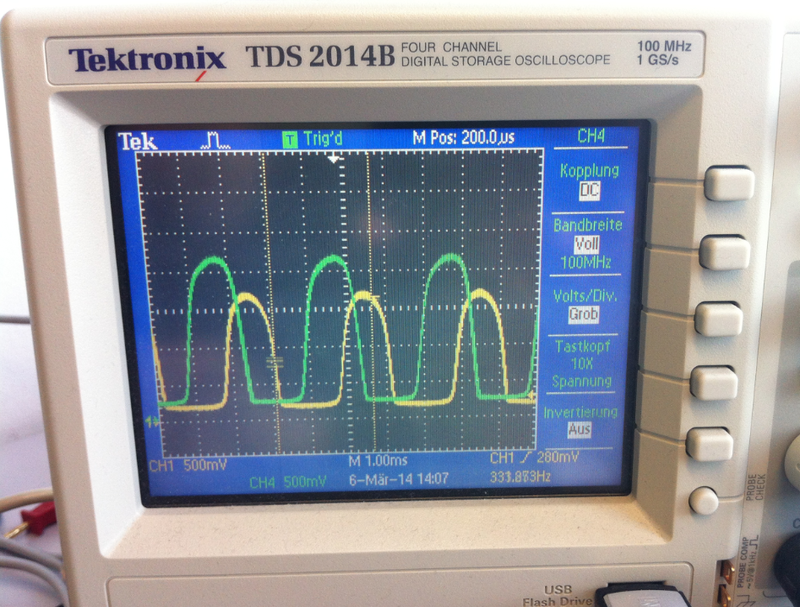 The challenge will be to provide a good analog output signal with the D/A converter. More about this later. 💡 In a next iteration of the base robot PCB, I want to have that circuit integrated. The I²C signals of the MPC4728 are available on the outer expansion connector. The MPC4728 only needs accessible during calibration. The calibration values are then stored permanently in the MPC4728. 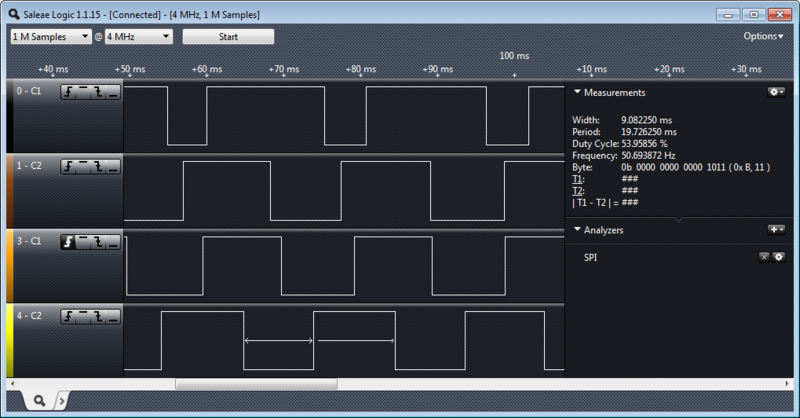 With Nyquist/Shannon, this means that I need to sample each encoder with 10 kHz. Let the motors turn slowly with a low duty cycle, e.g. 5%-10%. 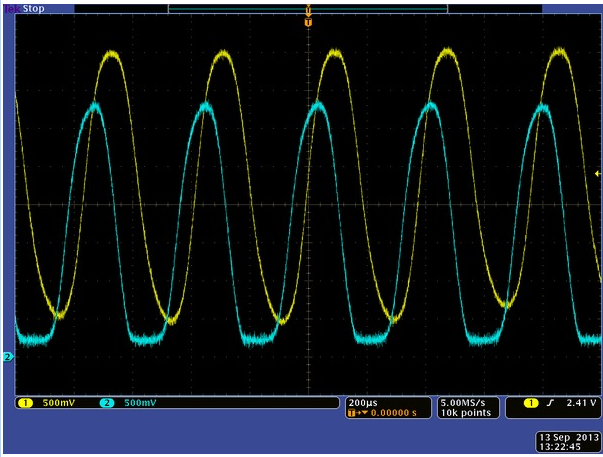 Monitor the digital quadrature signal with a logic analyzer. 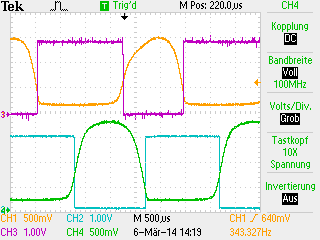 Increase/Decrease the voltage of the 4 D/A channels until each quadrature signal is having a 50% duty ratio. Do this for all four signals. The source code of the calibration application can be found on GitHub. The new encoders are a big improvement for the robot: higher precision, less costs, but requires some signal processing. Right now one robot is equipped with the new system, so the next days will be filled with more testing. 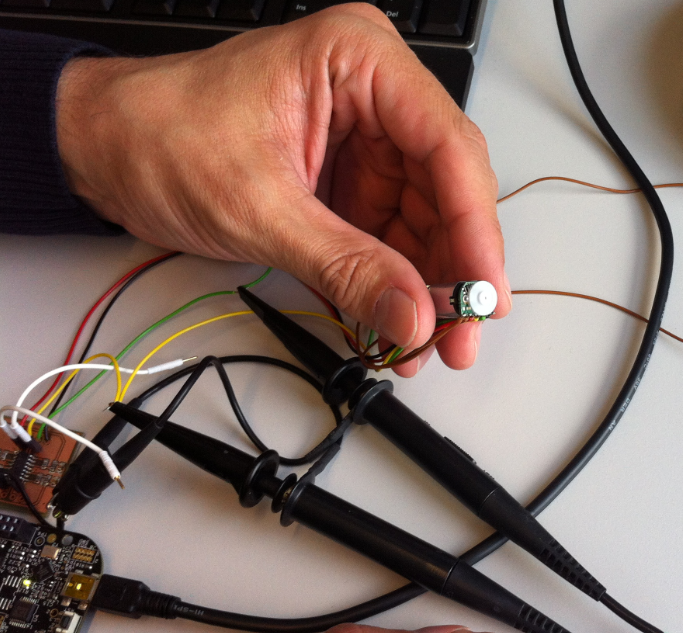 It started with manually tuning the encoders, and now I have a self-calibrating in place. I will need more tight sampling, but I will get a higher resolution. 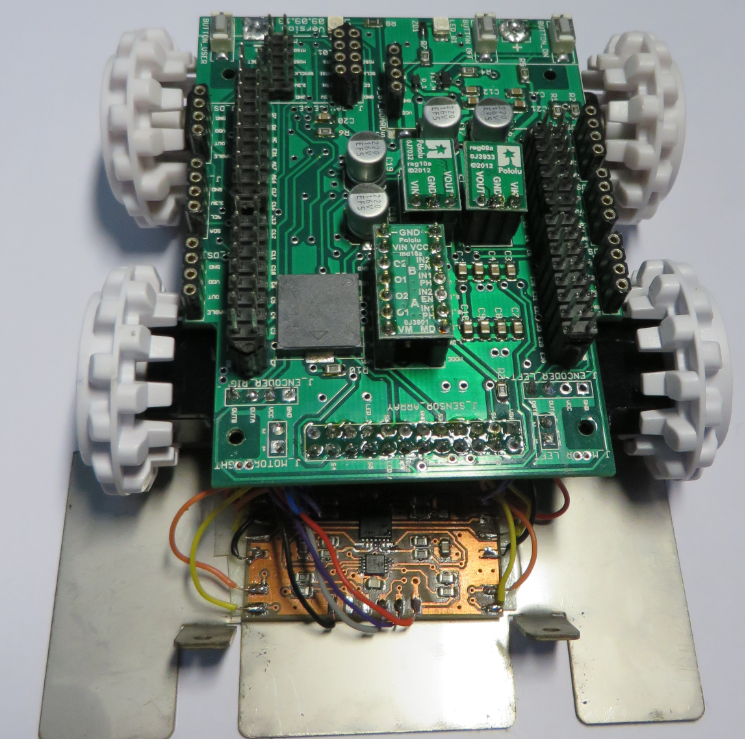 The extra workload will not be an issue for the ARM Cortex-M0+ I have as brain in my robot. The new encoders are a big quadrature step forward. 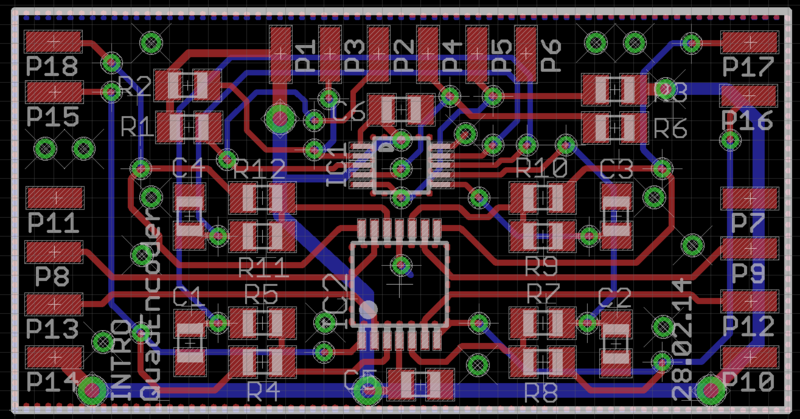 And for the next iteration we plan to integrate everything into the robot base board, including the microcontroller :-). PS: Thanks to Christian Jost and Andreas Albisser for their help and contributions in this project! 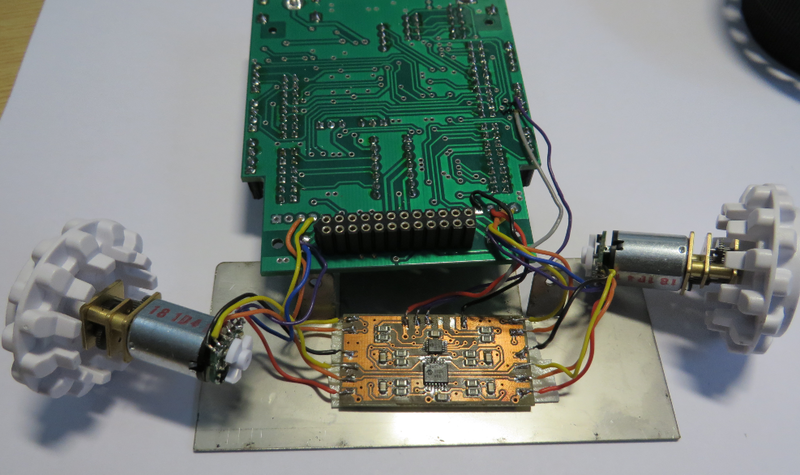 This entry was posted in Boards, Embedded, Tips & Tricks and tagged logic analyzer, open source projects, software, software project, technology, Tips&Tricks by Erich Styger. Bookmark the permalink. Nice work. I was pounding on them 3 years ago for my students to move it to the shaft. We actually had to make our own. The wheel version was nice so there was no calculations on the gearbox but they were used outdoors and used to get all sorts of junk in them. While we did not use them outdoor, even indoor having the encoders outside with the wheels the collected a lot of dust and dirt. And it was mechanical a challenge too. 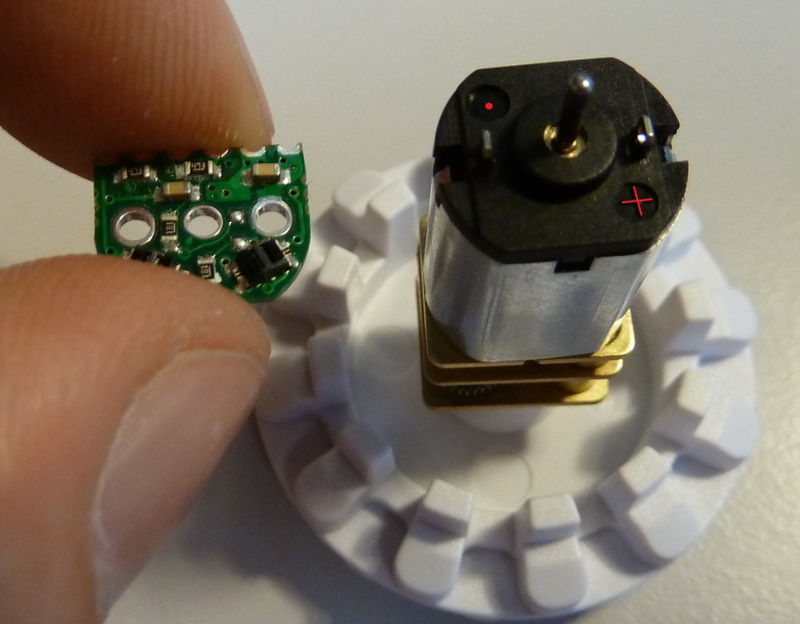 Pololu has nice shaft encoders, but only for the bigger motors. Excellent work! I love how neat the assembly is. For some reason I didn’t think I could run the encoder wires from the top so I cut holes in the under housing. Your way is so much better. The encoders are perfectly protected from the environment and the wires have no play in them. I’ve already had to resolder broken connections twice. Thanks :-). 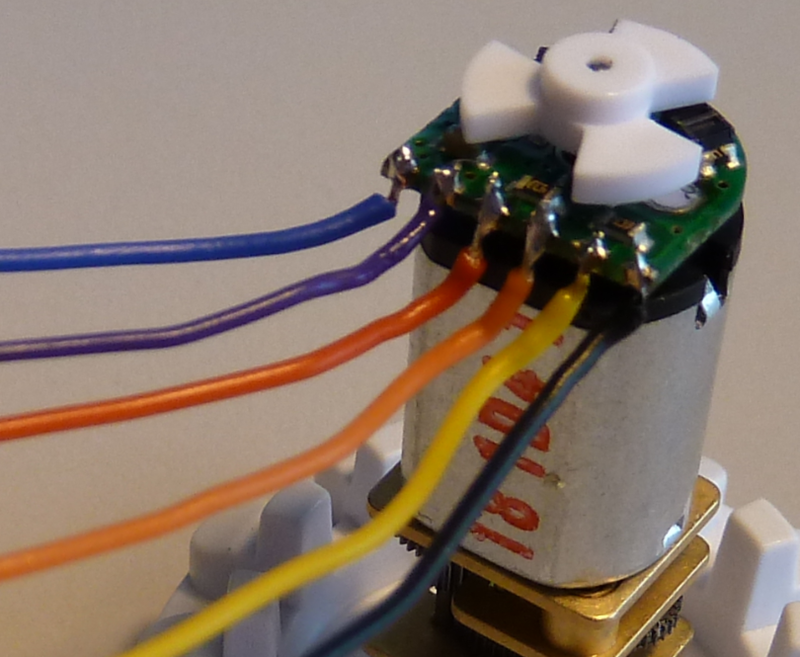 There has been a lot of consideration about how to put the wires and where to put the PCB. It is still a temporary solution. We had produced 40 robot base PCB’s, and 17 were left from the last course, so we used that 17 for the course in this semester. 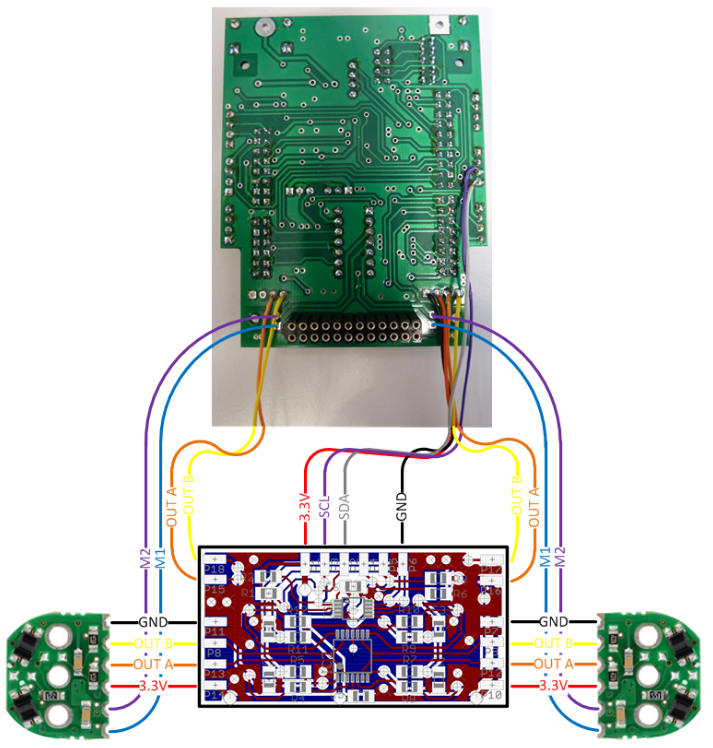 We already started the design of the new PCB (all parts integrated in a single PCB), but there was not enough time to finalize the design. Anyway I prefer an iterative approach: first making sure things work, then optimize it. So with the next iteration there will be much less parts, connectors and wires involved :-). And that MPC4728 is really a beautiful device. I’ve been using a non-optical solution for motor position encoding. 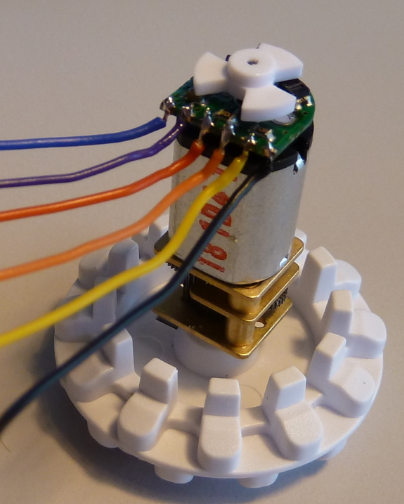 It’s the AS5048 14-bit magnetic rotary encoder. It comes with a PCB with all the parts, a magnet, and a magnet holder that fits on the shaft. A kit comes with all three. 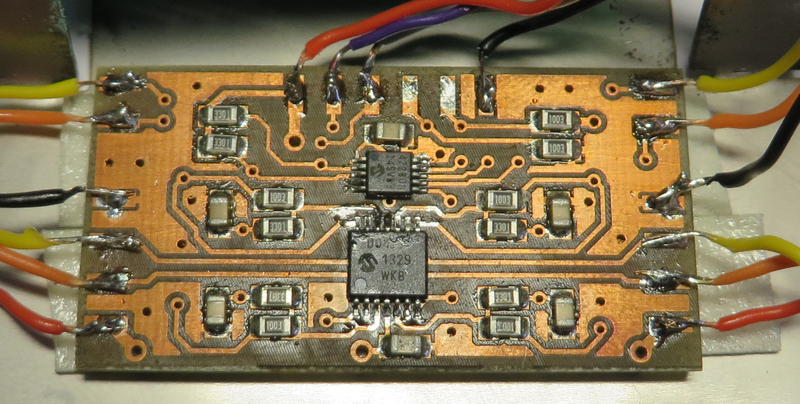 Position is via SPI, I2C, or PWM. http://www.ams.com/eng/Magnetic-Encoders/AS5048. The part is $US11.30 and the entire kit is $US25. thanks for that link, this is really an interesting product! 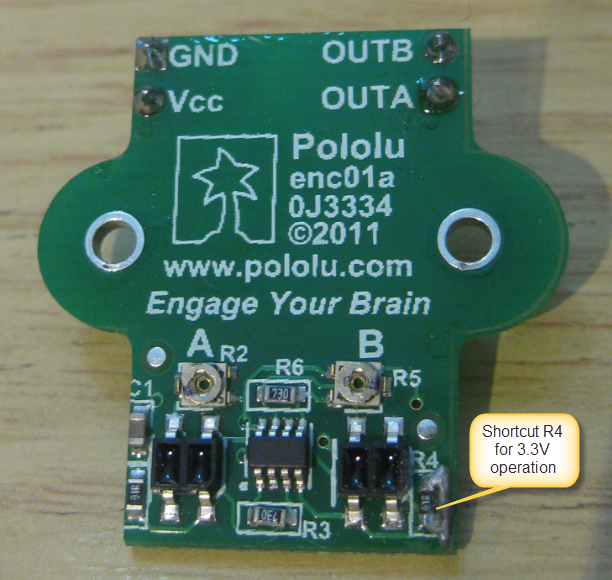 Have you used it with the Pololu Micrometal gear motors? Or with other (larger) motors? It looks that this is good choice for larger motors, but might not fit into my chassis because of space. I’ve used it only with bigger motors. If someone wanted to use it with smaller motors, they’d have to rig something up or make their own PCB. Agreed, that was my thinking too. I need to keep that interesting IC in my mind for one of my bigger motor projects. Now I would love to find a ‘low’ cost 12+ bit rotational encoder ICs especially when you can get M0 cores at under a dollar. Yes, ideally I want to have the counting down in the encoder (and just getting the counts). Jack was pointing me to http://www.ams.com/eng/Magnetic-Encoders/AS5048 which goes down that path. That’s definitely a solution for higher speeds, but the costs increase too. 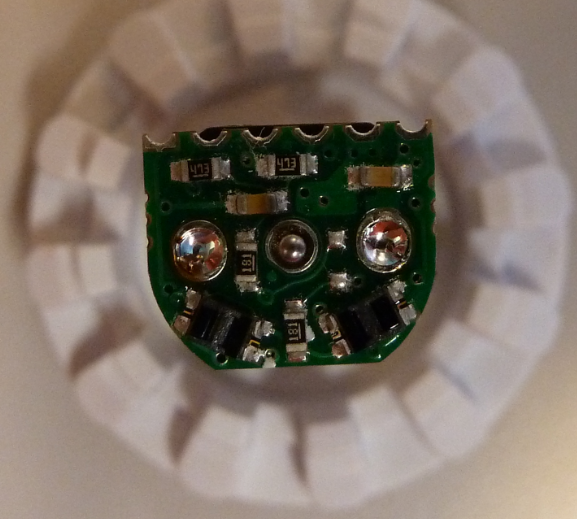 Magnetic encoders are more robust compared to optical encoders (dust, light, etc). 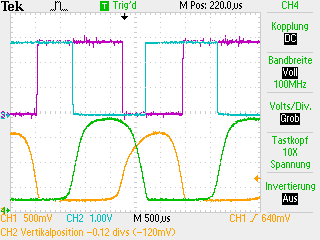 I searched a long time for an inexpensive IC which would do the quadrature counting for me, but I have not found anything usable. 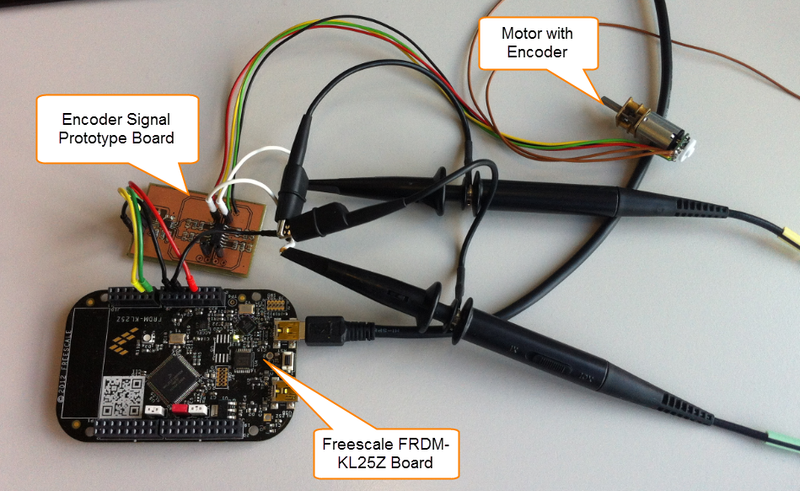 And yes, there are microcontrollers from Freescale which have quadrature counting on it. But when I want two independent PWM channels and two quadrature counters, then there is no (ARM) device from Freescale which can do this? Definitely the KL25Z I have currently in the robot does not have this. 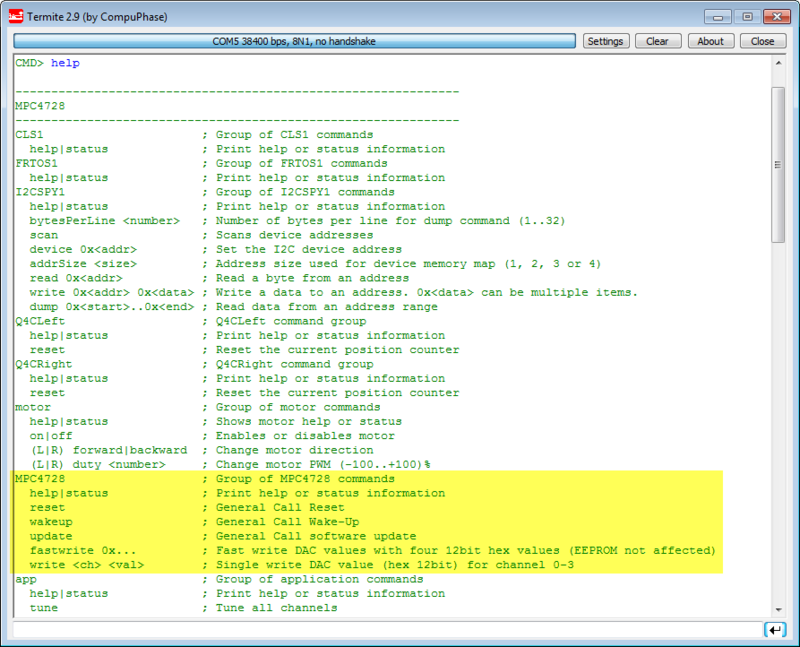 I used the ‘Freescale Solution Advisor’ which is a nice thing to enter the needed functions, and the result was that 0 devices are matching my needs. I’m sure there must be other devices out there, but I was not in a situation where I wanted to change the robot microcontroller. The other thing I consider is to use a very tiny microcontroller (instead of a dedicated IC) which does the encoding and probably the PWM for the motors: like a motor controller on a chip: two independent PWM’s, two quadrature encoder on it. And then the main processor would care about the overall robot tasks. So I still have many options. 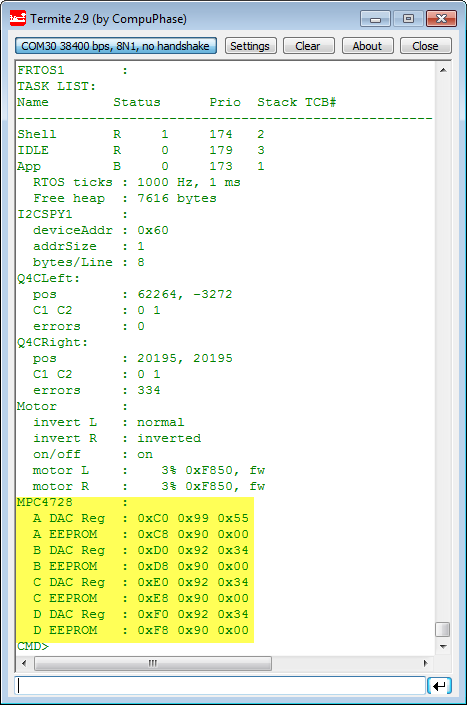 I did not look at the MCP4728 but I was wondering why you did not use the built in comparator and the internal DAC to set the level for the data slicer. 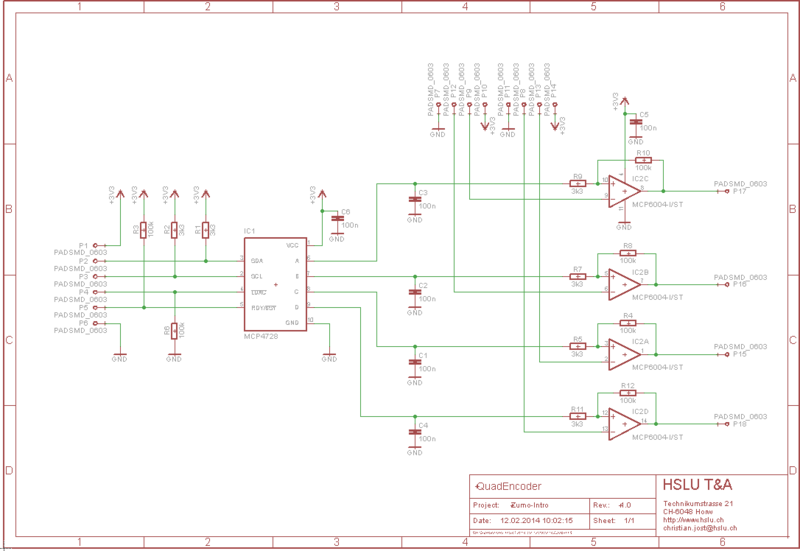 I guess having only one comparator and having to scan the mux would be a be a challenge.